Check out Part 1 here and then come back to continue hearing Tim’s story. This idea that even our dream of what we thought we wanted to do ended up becoming true in a way: what we wanted was just a place where people could become themselves and step into their own story. We just had to learn why that original vision wasn’t the best way to go about it…When I got the job at Starfire that was in 2000…at some point I volunteered to go on an outing with Starfire and we went down to the Showboat Majestic and we saw this play and myself and Maria who was a member of Starfire at the time got chosen to go on the stage and be in the play. I was Mrs. Claus and she was Rudolph or something and it was just a good time. The next week my roommate gave me this flyer from the paper, this was when they still had ads for jobs in the paper [laughs] and it said Starfire hiring full-time activity coordinator. My roommate Kathy gave me the ad and it was like “oh wow, this is perfect timing.” I was about to graduate college, Bridget was doing a year of volunteering at the Christian Appalachian Project so she’s not going to be up here for a while, so I went for this job and I got it. I remember they said I was too enthusiastic, that was the one knock against me. I was too enthusiastic about it. Then I got hired and my job was to lead outings, recruit members and to double the amount of outings. Within about two months they gave me the job of being volunteer coordinator as well. I had to recruit all these volunteers, so I did all that. And my goal was to get community people. They wanted me to get parents and families, and I got citizens, like college students and community members, and then we grew those outings to like 100 a month. When I came there were about 40, and then were 100. Lynn, the executive director then, she was a really good executive director. She did the right thing all the time. She always tried to say, is this honest? is this right? That was really helpful to learn that lesson very young- what’s the right thing to do? And then eventually…she asked if I wanted to be the executive director. I said sure. She and the board spent 6 months teaching me how to do all these things, and then she went on maternity leave, and then it was mine from there. That was 2006. September of 2006. So it’s now been 8 years and along the way, Bridget and I moved to Bellevue in 2002. We bought a house and we got married. We had two children there. Around 2007 or 2008 we started learning the deeper parts of this work that was by meeting Jo Krippenstapel and having coffee with her and she started giving me articles and started challenging some of my previous assumptions about the work; but also honoring the core of what we believed in. That story about Dominic and the whiskey, those stories were honored, but the one about wanting to start a farm [laughs] was like challenged. It was hard to have those things I thought I was right about and being told I was wrong, but then again it was helpful to have a mentor to hold my hand through that. We had started Starfire U already which is a big giant program which got a lot of excitement around and quickly started to learn from people like you, Candice that this should be taught by citizens and not by us, and then from Jo and Bridget and Erica, figuring out PATH plans; it should be your vision Chris, instead of my vision. Ever since 2008 it’s really been about really getting deep in learning and learning what’s even better and what’s even better. Questioning ourselves and being okay with that and being okay with change and imperfection. And then, that’s coupled with the story of being in Bellevue. We realized people needed people to care about them again. We noticed that we didn’t care about our neighbors and we didn’t think our neighbors cared about us. We started to say, what if what we had to do was figure out how to live this, while we were helping other people figure out how to live it in their neighborhoods. That’s where it got really tangled up. And we said, let’s just live in Bellevue forever and work on this neighborhood building and relationship building stuff and we’ll hopefully learn something from that. And we’ll take that and learn something from it for disability work and inclusion. And then what we learned from inclusion and disability was listening to people and honoring people’s individuality and finding a way to make a stand against structures and rules that keep people out and then we would take what we heard there and bring it back to Bellevue. And all these things play against each other and it’s really awesome now because we get to see all the ins and out of this stuff. We see people with disabilities overall marginalized in society, but then we also see how people were just marginalized in Bellevue and they don’t have disabilities. Or we can see people marginalized in Bellevue on a real local level, not on a program level. We can see it through the eyes of a citizen. He’s getting to the stage where he’s noticing differences and he probably also feels that, I’m guessing here, that Onyx isn’t the cool kid. He’ll learn this but not without me teaching him. We walked over there and started walking with Onyx. And of course we notice, it’s slow to walk with Onyx. We might even be a couple of minutes late is in the back of my mind. And it’s probably in the back of Aaron’s mind too. But we get there and I introduce Onyx to Bridget and we just said “have a great day!” It’s just simple moments that we’ve discovered that are really important to us. Don’t miss a moment you have to put yourself out there…you have to wait for them. You have to cross the street and say I’ll walk with you, even if it makes me a little bit late. And it’s only for a few minutes and it doesn’t even matter in the grand scheme of things. Onyx would have gone on with his day… But something would have been lost. We have to be awake citizens and notice the moments when we can create a small connection. And we don’t think that– I’m not foolish, I’m not Pollyanna. I don’t think those moments make a hill of beans difference, unless they are cumulative. If we do them every single day, I think they are transformative. I think they make Onyx’s life better. I think they make our lives better. I think they make Bellevue better in a really significant way. CS: What advice would you give to a young person starting out? TV: That’s a good question. What I was tempted to do was to just learn it on my own. I would have loved to have had a mentor earlier but not just one but like 10 mentors. If I was a young person I would say from the age of 12 or 13, find people, your parents, your parents’ friends, someone that you look up to, and ask that question intentionally and then ask them that question over the course of a few years. Any person in their twenties should do that too. If you want to know how to have a good relationship with your spouse, you should go find some people who have a good relationship and go ask them that. If you want to know how to be a chef, you should go find some chefs and go ask them… I believed this story that if you just worked hard enough and studied by yourself you’d become something. And what I just understand now, is that it’s the relational aspect of learning…it’s just so important and it comes with a whole network now. It comes with credibility and experience and that brings so much more. You can study anything. You learn anything. You can try to do anything. 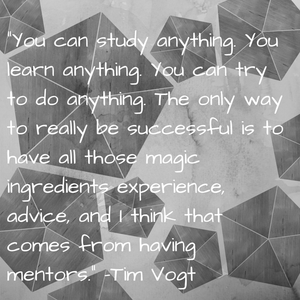 The only way to really be successful is to have all those magic ingredients experience, advice. And I think that comes from having mentors… I don’t necessarily like the question “will you mentor me?” I like the question “can we talk about this?” Then I really love when you get in a few years of that conversation then you can look back and see that it was mentoring. There’s this pressure around mentoring that someone has to mold me and I just don’t think that should be a part of the conversation. With my most beloved mentor, Jo, I remember thinking, I never knew she was mentoring me. We were just having coffee that’s all we were doing. And then, maybe two years ago we were sitting at that table back there [at RedTree] and we were presenting an idea and somebody said, “Now Tim, how are you learning all of this stuff? Do you have a mentor?” And I was like “yeah” and I pointed to Jo. She’s my mentor. That was the first time I had already said it or knew it and we had being having coffee for four years. I want people to say I want to have conversations and I want to learn. I don’t like it to be named. Or singular either. I’ve learned it from Tom Kohler, and Candice, and Mike Holmes, and Bridget and books that I’ve read. I’ve learned a lot from a lot of people. It has to be bigger than one—mentors.